With this little addendum to The Lord’s Prayer, Jesus has caused me and countless others more consternation than all of his other extreme statements combined. A big part of me wants to take Jesus to school and tell him that God’s forgiveness is bigger than my unforgiveness and that I am forgiven by the power of the cross. But wait a minute; this is Jesus who said this! It’s in the Bible! He’s the one who went to the cross – surely he of all people would know that sins are forgiven on the basis of his shed blood for me and for the sins of the world. So then, what is the point? What is he saying to us? Is there a deeper meaning? Something that he is warning us about? As we think about it together, we can conclude that this is, quite obviously, a very harsh warning. It’s pretty straight forward – if we don’t forgive others, then God won’t forgive us. And as much as I would like to correct Jesus on this, or explain it away or write eloquently on why Jesus didn’t really mean this, I just can’t. The evidence is overwhelming – Jesus taught this several different times and he even gave us the parable of the servant who didn’t forgive someone his small debts when he himself had been forgiven much (see Matthew 18:21-35). So then, long story short, I must forgive if I want to be forgiven. No ifs, ands, or buts about it. I can’t argue about it, plead with Jesus about it, or work my way around it. I just have to do it. Whether I want to or not, I just have to forgive. And perhaps that is the way Jesus wants it. Maybe he is so black and white on this issue – so unflinching and straight-forward with no room to wriggle out of it – simply because it is so important to our well-being. Unforgiveness, as anyone who has been there can attest, is a toxic poison that can quickly taint a person’s soul. And it can spread like cancer, starting with one unfortunate event that lies there unforgiven, and then that open wound begins to fester and bitterness sets in. Before long, we’re not speaking to that person and just the mention of his or her name brings up a well of hatred from deep in our soul. If we don’t forgive and get rid of it, it can consume us to the point that we are totally fixated on our hatred for others rather than God’s love for all of us. It’s a horrible way to live, friend, so please don’t go there. Forgive. Right now. Before it is too late. Don’t let the darkness of unforgiveness and hate extinguish the light of Christ in your life. Instead let the light of Christ illuminate the dark corners of unforgiveness in your heart. 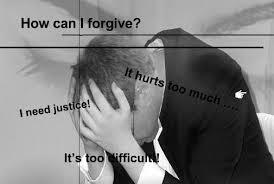 Confess your unforgiveness to Him and ask Him to help you to forgive those who have hurt you. Remember that this is for your sake, not for those who have hurt you or even for God. You need to do it for you, and the health of your soul depends upon it. If you hold on to that unforgiveness, it will be you who is hurt, not them. It will be you that closes your soul to God and it will be you that chooses to live in eternity without Him. I know that this is a harsh warning, but Jesus meant it to be this way for our own good. Just as a loving parent will tell a child of the harsh consequences of running out on a busy street, Jesus is telling us to stay far away from the consequences of unforgiveness. As a pastor, I have seen it time and again – the person who can’t forgive others also has a hard time finding forgiveness for themselves. There seems to be some kind of spiritual door that swings both ways – the door that allows grace and forgiveness to flow into a person is the same door that allows grace and forgiveness to flow out to others. Open the door of your heart today. Push it wide open, as far as it will go. Forgive others, just as your Father in heaven has forgiven you. You won’t be sorry – you will be greatly rewarded! The love of God and the light of Christ will flood your soul with His healing balm. Inexplicable joy and a peace that passes all understanding will be yours as you rejoice with those who are redeemed and forgiven. So don’t put it off another moment. Go to the Father in prayer – right now – and begin to forgive those who have hurt you in the past or are even causing you pain in an ongoing situation. Trust God to bring justice and correction to the situation; for now just forgive them from your heart. Mark 11:25 And when you stand praying, if you hold anything against anyone, forgive him, so that your Father in heaven may forgive you your sins." Luke 6:37 "Do not judge, and you will not be judged. Do not condemn, and you will not be condemned. Forgive, and you will be forgiven. To be a part of the conversation about the article above, or even if you just want to read what everyone else is saying about it, go to the Forgive or You Will Not Be Forgiven Comments Page. This article is Day 28 of the 40 Day Devotional; the next devotional is Day 29.